Mike Cullumber, Steve Yee, Richard Miller, Kristy Wapniarski, Bud Lord, Becca Bell, Frank Miller, Diana LaBeau, Terry LaBeau, Jackie Levario, John Gentile, Jennifer Harvey, Jennifer Nelson, Bob Pian, not picture Arvid Veidmark. 13 students plus two presenters. 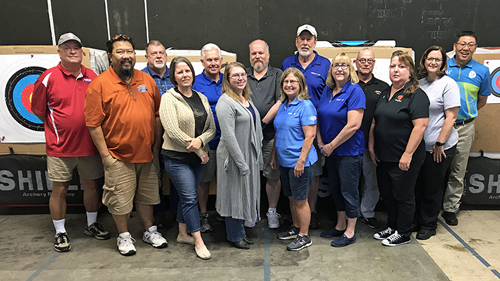 The 2018 two day USA Archery Arizona judge seminar took place on 22-23 September at Specialized Services Company Boring, 1951 West North Lane, Phoenix, hosted by Arvid Veidmark. The USA Archery judge seminar presentation covered a wide varied of topics ranging from officiating philosophy to match play. The seminar presenters were international judges Mike Cullumber and Bob Pian. Cullumber has conducted 10 judge seminars in 2017 and 2018 and provided great insight as to judges and judging around the county. A wide variety of USA Archery members to part ranging from a new member to national judges. All but one was from Arizona. (Jennifer Harvey came from New Mexico) No one needed to take the certified judge seminar, two took the national judge test. Registration is now open for the 2018 Iron Archer tournament to be held at the Indoor Range at Ben Avery Shooting Facility in Phoenix, Arizona on November 17-18, 2018. Come celebrate the 15th Anniversary! Registration is open for the USA Archery Phoenix Judge Seminar scheduled for September 22-23, 2018. For judges, those interested in becoming a judge, and anyone interested in tournament rules and procedures. Presenter: International Judge Bob Pian, plus other presenters as needed based on registrations. Note that a USA Archery sanctioned judge seminar, workshop or conference is required every three years to maintain judge certification. Contact srhodes@usarchery.org to check national judge testing eligibility. Register via the USA Archery membership portal. Judge seminar, September 22-23, 2018. Judges, those interested in becoming a judge, and anyone interested in tournament rules and procedures. Save the September 22-23 Saturday and Sunday dates for a two day judge seminar. The tentative location is 1951 West North Lane, Phoenix, 85021, the tentative presenter is International judge Bob Pian, sanctioning subject to USA Archery endorsement. Seminar and registration information will be published in the summer. Deadline for registration: March 23, 2018.